Muskoka Brewery is one of the best breweries in Muskoka. 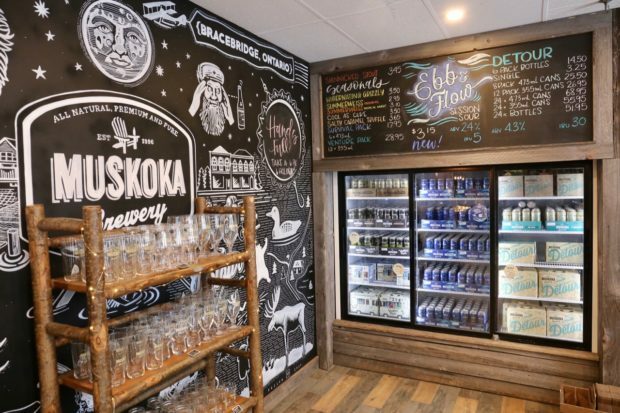 Located in the heart of Ontario cottage country, the popular craft brewery in Bracebridge houses a state-of-the-art production facility, retail shop, tap room, and hosts daily tours. The Tap Room at Muskoka Brewery. Gary McMullen and Kirk Evans started building their craft beer dream in 1995, opening the doors of the original Muskoka Brewery in June 1996. Today, Muskoka Brewery is owned and operated by Todd Lewin and Bob MacDonald. 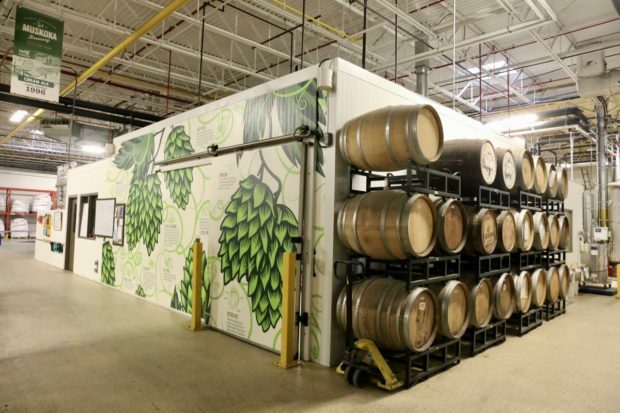 The duo have transformed a small craft brewery (8,000 sq ft) to a large production facility (40,000 sq ft). 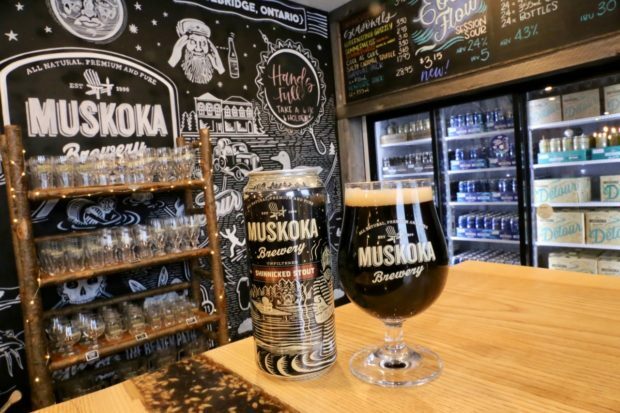 Muskoka Brewery President, Todd Lewin describes the company’s growth since he began with the company in 2010, “We’ve been fortunate to achieve some good growth over the past eight years. In terms of beer volume, we’re about six times as big as when I got here and have also ventured into the distilling business. In the same time frame, our team has grown to meet this demand, adding 100 team members to expand our operations and market reach. Since moving from Taylor Road to Muskoka Beach Road, we’ve expanded our production and community space substantially. Whereas the old brewery was too small to allow visitors a closer look beyond the tanks, our new space allows an improved education experience as it pertains to brewing operations. 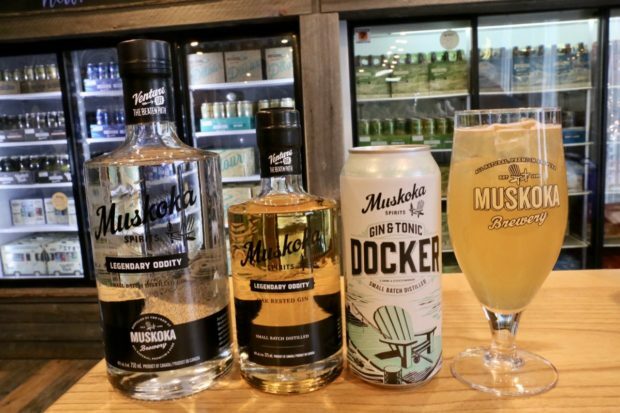 Muskoka Brewery’s line of canned craft beer and gin. 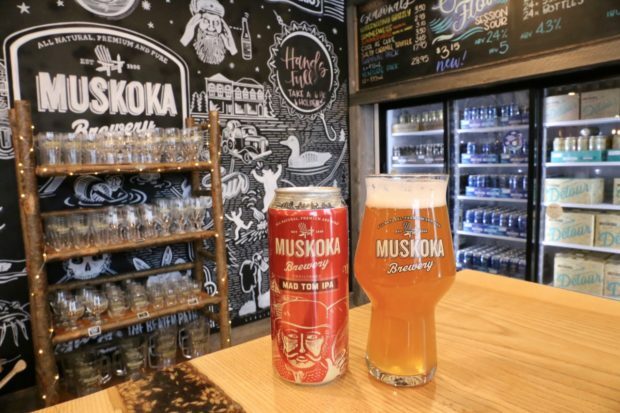 Located just outside of downtown Bracebridge, Muskoka Brewery offers free tours that run throughout the year. Tours typically run every hour Monday through Saturday from 12pm to 4pm and from 12pm to 3pm on Sunday. If you’ve got a large group contact the tap room to book your visit in advance. Be sure to check the breweries website for tour times as they change seasonally. 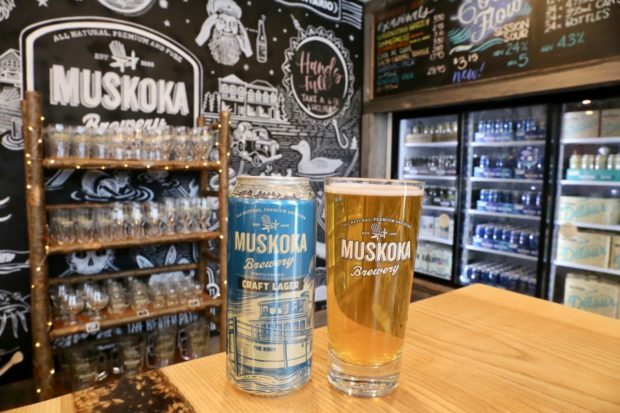 Take a free tour to learn about how the best Muskoka beer is made. Skip through Muskoka Brewery’s Brewhouse to learn about the brewing process. You’ll learn about how they mill barley and add hops to their craft beer. You may even meet a friendly Brewer at work. Visit Muskoka Brewery’s Quality Control Lab, where every beer leaving the production facility is tested for quality and freshness. 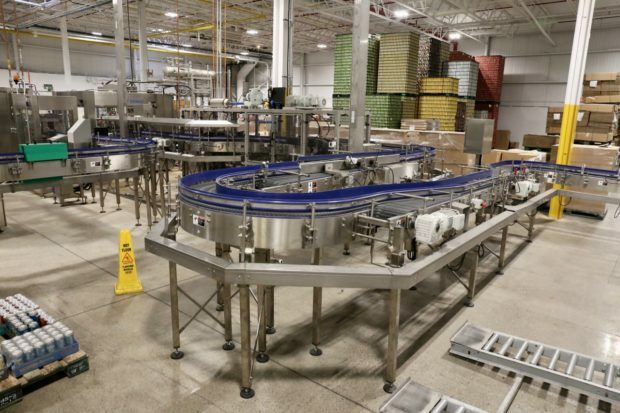 Stroll over to the bottling and canning lines where on packaging days you’ll see state-of-the-art machines in action. Finish at the Tap Room to sample fresh Muskoka Brewery beers. The breweries canning and bottling line. 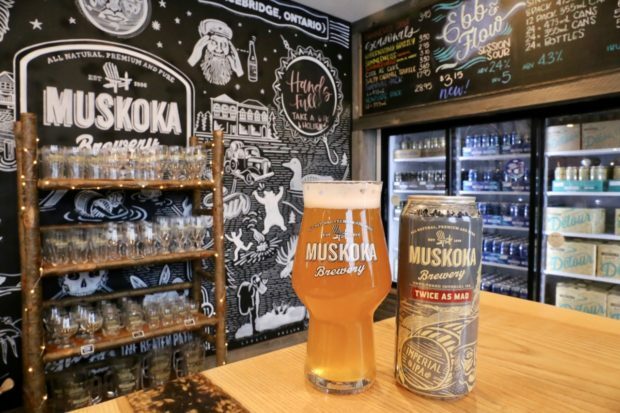 Muskoka Brewery produces some of Ontario’s most popular craft beers. The massive production facility in Bracebridge brews a parade of award winning beers including a Cream Ale, Craft Lager, Indian Session Ale, Session Sour, Indian Pale Ale, Imperial Pale Ale, and Stout. In recent years, Muskoka Brewery launched a distillation program, which produces one of Ontario’s most celebrated dry gins. If you’re keen to sample and find a new favourite in Ontario, pick up Muskoka Brewery’s Survival Pack at your local LCBO or Beer Store. The speciality craft beer pack includes twelve 355mL cans including Muskoka Brewery’s Cream Ale, Craft Lager, Detour, Mad Tom IPA, Shinnicked Stout and Hibernating Grizzly Grisette. Speciality craft beer at Muskoka Brewery’s retail store. 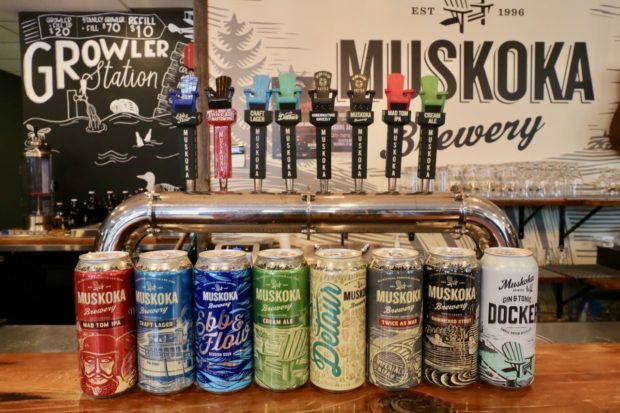 Muskoka Brewery offers two unique beer programs beyond their iconic line of craft brews. Brewmaster Curtis Bentley describes Muskoka Brewery’s unique style,” In my time at Muskoka Brewery, our approach to product development and improvement has been more a comprehensive team approach as opposed to relying on one single person or department. We all communicate and contribute ideas about what’s new and popular as well as where our beers fit within the current Ontario craft beer landscape. One of the first beer programs of its kind in Canada, the Moonlight Kettle Series allows Brewmaster Bentley to develop new beers. Each month they release a new beer developed by a trio of Muskoka Brewery staff. The brewery pairs one of its expert brewers with two employees from any department within the company. Together they choose a unique beer style and name. Brewed exclusively by each brew team, these never-before-released creations are only available at the Muskoka Brewery taproom in Bracebridge. You can also order a 4 pack of each month’s Moonlight brew delivered to your door. 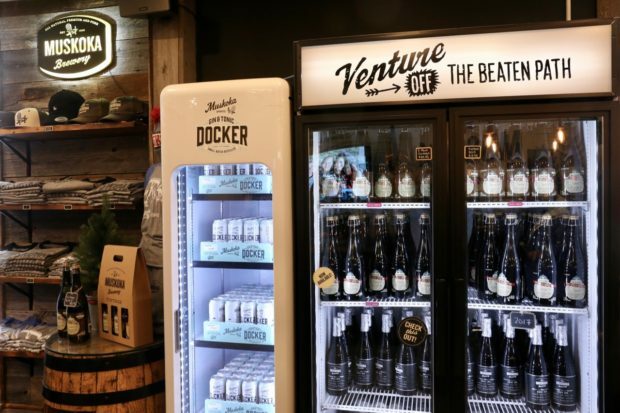 One dollar from every bottle sold from the Muskoka Brewery Community Venture Collection is donated back to the Venture Fund – a program to support worthy non-profit causes such as the South Muskoka Hospital Foundation, Hospice Muskoka, Muskoka Conservancy and Lake Ontario Waterkeepers. Muskoka Brewery has released two do-good bottles thus far: American Blonde Ale aged in Chardonnay barrels and a Brut IPA. Upcoming collabs in the collection will feature Vancouver Island Brewing, Quidi Vidi and Wild Rose. The brewery also produces popular seasonal craft beers. In July and August enjoy Cool as Cuke and Summerweiss Tropical Wheat, Harvest Ale in the Fall and Shinnnicked Stout when it snows. Muskoka Brewery’s flagship beer was first brewed in 1996. Muskoka Brewery’s Cream Ale is considered the signature beer for cottagers and campers in Muskoka. Bright amber in colour with aromas of baked apple, orange zest and caramel. Won Silver at the World Beer Championships and Gold at the Ontario Brewing Awards. Muskoka Brewery’s all-malt craft lager is perfect for those looking for an easy-drinking option. Haze and sediment in the brew is a result of a pure and unfiltered brewing process. 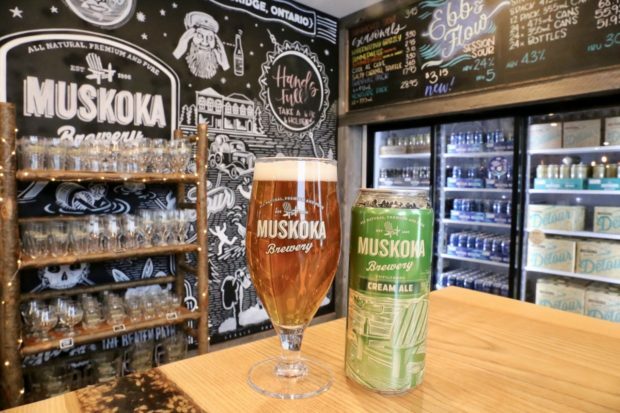 Muskoka Brewery’s Craft Lager pours a bright gold and offers earthy aromas. Lager style beer at 4.8% ABV and 13 IBU. Malts: 2 Row Pale Malt and Crystal 40. Hops: Magnum and US Saaz. 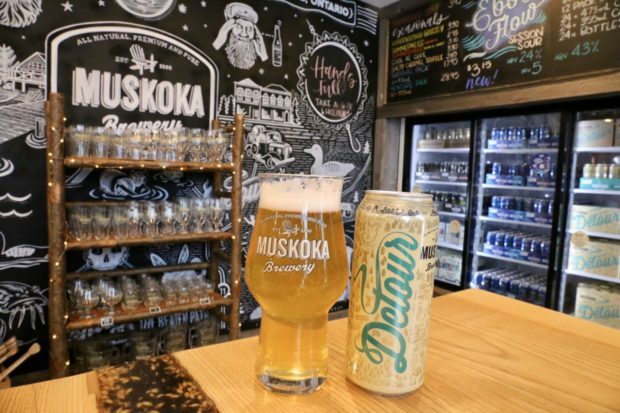 Muskoka Brewery’s Detour was one of Ontario’s first ISA. Muskoka Brewery Detour pours a bright gold and offers tropical aromas such as pineapple and guava. India Session Ale at 4.3% ABV and 30 IBU. Malts: Marris Otter, Dextra Pils, 2 Row Malt. Hops: El Dorado, Citra, Sorachi Ace. 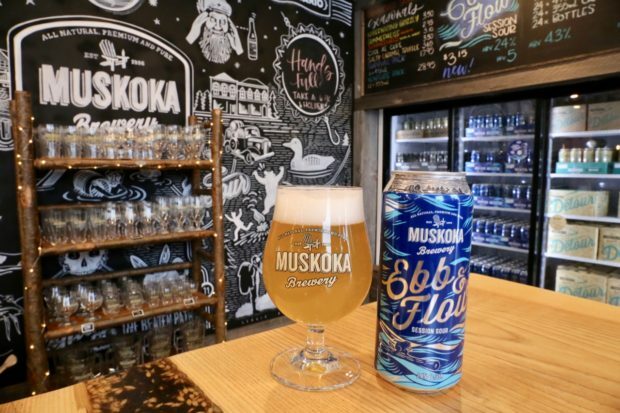 Muskoka Brewery’s Ebb & Flow is an easy-drinking quencher with a light-bodied finish. It’s the perfect low alcohol beer to enjoy during a work lunch, or night out with friends when you’ve got an early morning. Ebb & Flow pours a pale straw colour and offers aromas bursting with grapefruit, lime and tropical fruit. Session Sour at 2.4% ABV and 5 IBU. Muskoka Brewery’s Mad Tom IPA is the perfect beer for hop heads. Inspired by late night stories around the cottage camp fire, Mad Tom IPA was one of Ontario’s original India Pale Ales. Mad Tom IPA pours a burnt orange colour and offers aromas of grapefruit, orange, and pine. Indian Pale Ale at 6.4% ABV and 64 IBU. Muskoka Brewery’s Twice As Mad is an aggressively twice dry-hopped Imperial Pale Ale. Twice As Mad pours a burnt orange colour and offers aromas of grapefruit, orange and pine. Imperial Pale Ale at 8.5% ABV and 71 IBU. Won Silver at the World Beer Championships and Ontario Brewing Awards as well as Bronze at the Canadian Brewing Awards. Muskoka Brewery’s Shinnicked Stout is a rich and velvety beer infused with Muskoka Roastery’s Signature Lumberjack coffee. Shinnicked Stout pours a dark brown with aromas of roasted malt and coffee. Oatmeal Stout at 5.2% ABV and 19 IBU. Malts: 2 Row Malt, Munich Malt, Chocolate Malt, Oat Flakes, Toasted Barley Flakes, Crystal 120, Dextra Pils. Won Silver at Ontario Brewing Awards and Bronze at the World Beer Championships. 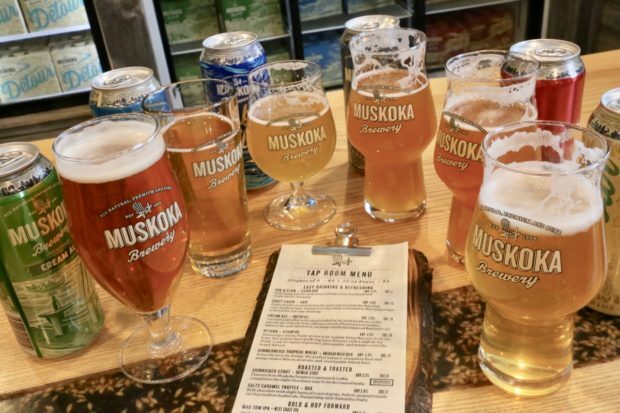 Enjoy a craft beer tasting at Muskoka Brewery’s Tap Room. 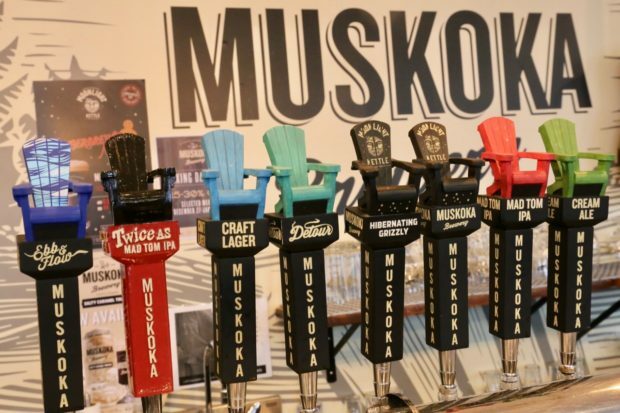 In 2015 Muskoka Brewery expanded its beverage offerings after purchasing a still. Since then the brewery’s spirit fans have been tinkering and experimenting to provide a high quality line of gins. A small batch distilled gin featuring wild juniper, orris rot, range peel and fresh heather tips. In keeping with the breweries roots, the infusion of Sorachi Ace hops offers a fresh citrus aroma. This dry gin offers light floral notes and subtle bitterness. Aged in oak barrels, offering a refined twist on Muskoka Brewery’s signature dry gin. Perfumed vanilla is met with woody spice that compliment classic juniper. Works well in a classic Old Fashioned cocktail. A blend of Muskoka Brewery’s Legendary Oddity Gin with the refreshing twist of citrus and cucumber. Unique golden hue is a result of all-natural tonic made with real cinchona bark by Porter’s Tonic. Perfect tall can to enjoy dockside straight out of the can or splashed over ice with a slice of lime. The bottle shop at Muskoka Brewery.